George Graham Reviews Cindy Bullens' "Dream #29"
There are more women in rock music than there used to be, but female roots rockers are still fairly rare. 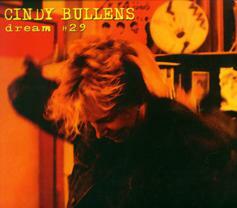 This week, we have a fine album by a veteran rocker who has moved toward the roots rock sound and turned out one of the best albums of a nearly 30 year carer: Cindy Bullens, whose new CD is called Dream #29. Born and raised in Massachusetts, Cindy Bullens moved to Los Angeles in 1974, hoping to launch a career in music. According to her biography, her tactics included crashing a studio party to meet Elton John, who was sufficiently impressed that he hired her as a backing singer in 1976, and she appeared on his album Blue Moves that same year. She then turned up on the soundtrack to the film version of "Grease" which was nominated for a Grammy for her vocals, and followed that up with her debut solo album in 1979, which was also nominated for a Grammy. After her second solo release in 1980, she mostly stopped performing to turn her attention to raising a family. In the mid 1990s, Ms Bullens began collaborating with some Nashville songwriters like Al Anderson and Radney Foster, and with her daughters growing up, became more active in songwriting. Several of her songs such as Hammer & Nails were recorded by artists ranging from New Orleans soul veteran Irma Thomas to the Dixie Chicks. She began actively recording demos and self-released a CD in 1994. Two years later, the death of her daughter Jessie inspired a CD called Between Heaven and Earth which attracted wider attention and helped renew her career. She toured and opened for Emmylou Harris among others. Another interesting aspect of her career came in 2001 when she collaborated with playwright John Wulp on "Islands" a musical about North Haven Island off the coast of Maine. She also began a musical collaboration with producer Ray Kennedy, the musical and business partner of Steve Earle, which resulted in the CD Neverland. Now she is out with Dream #29 her sixth solo effort, and it's a very tasteful and mature work. I suppose it could be called rock for grown-ups. The music has all the energy of rock's halcyon days, with thoughtful, literate lyrics, which are mainly about relationships that did not always turn out as expected. She is joined by a first-rate band, which includes guitarist George Marinelli, who has been a part of Bonnie Raitt's group, Garry W. Tallent, of the E-Street Band on bass, plus Dennis Burnside on keyboards, and Ginger Cote on drums. She is also joined by some notable guests, including her old employer Elton John on piano on one track, Delbert McClinton on vocals on another, and Tim Wakefield, the Red Sox pitcher who has also launched a musical career. As a Red Sox fan, Ms. Bullens seemed particular enthusiastic about having Wakefield appear, and she is shown in the CD booklet holding the 2004 World Series trophy. I guess if you have been doing rock as long as Ms. Bullens, and you perform in a style which is true to ones self, it becomes roots rock. Her band is a straight-ahead rock group with strong electric guitars, vintage Hammond organ and Wurlitzer piano, and an air-tight rhythm section. Ms. Bullens, never a screamer, locks right into the band with her guitar and vocals, rocking, but also often imparting a slightly melancholy texture, with several songs about loves torn asunder. Cindy Bullens new CD Dream #29 marks an impressive new opus from an artist with a nearly 30-year career, spent in part in support of others, and then after an extended absence from the recording scene. It's a kind of epitome of what a roots rock album should sound like -- with good basic instrumentation, played very tastefully -- and some excellent songs that combine thoughtful, literate lyrics with a usually strong, driving beat. In a way, it's a kind of rock singer-songwriter album, though Ms. Bullens insists that at her core, she is a rocker. Her often understated vocals mesh nicely with the strong but subtle rock instrumental backing. Our grade for sound quality is about a B-minus. Points were deducted for excessive audio volume compression that is heavy even for a rock album, and reached the point of some breakup in the sound of the electric guitars in spots. The mix does has everything in the right place, and there is a good punchy sound to the drums, but the lack of dynamic range detracts from classy performance by the gathered musicians. Not all rockers mature well. It can be sad seeing some trying to maintain the facade of youthful rebellion well past their prime, while others go too far in the other direction and try to become lounge singers. Cindy Bullens keeps on rocking, while doing so in a way that embraces life's experiences, as well as the grace that maturity can bring.